It's powered by a liquid cooled 399cc single cylinder four stroke engine, producing 27.2bhp at 7,750rpm and maximum torque at 6,250rpm. RRP is £4,400 or £4,500 for the special edition. For storage the underseat compartment, complete with LED courtesy light, takes one full face helmet (plus small A4 sized bag) and the front sealed but non-lockable glovebox includes a 12V socket for charging your mobile. For security the ignition is protected by a key coded shutter (like the Suzuki Burgman 400). The cast Aluminium 14" front wheel takes a Maxxis iPro 120/80 tyre and the rear 13" a 150/70. Accessories include a high screen, 30/39/47 litre Givi top box with optional backrest, console bag, steering lock and handlebar mitts. 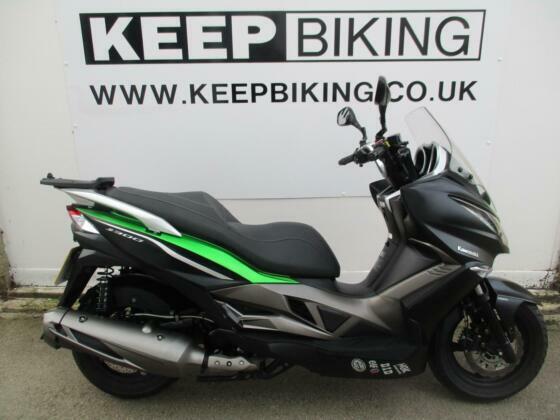 The special edition is £100 more and gets you the green/black paint scheme.